As the Paris climate talks enter their final hours, the likelihood of a successful agreement is coming down to negotiations between developed and developing nations regarding finances. 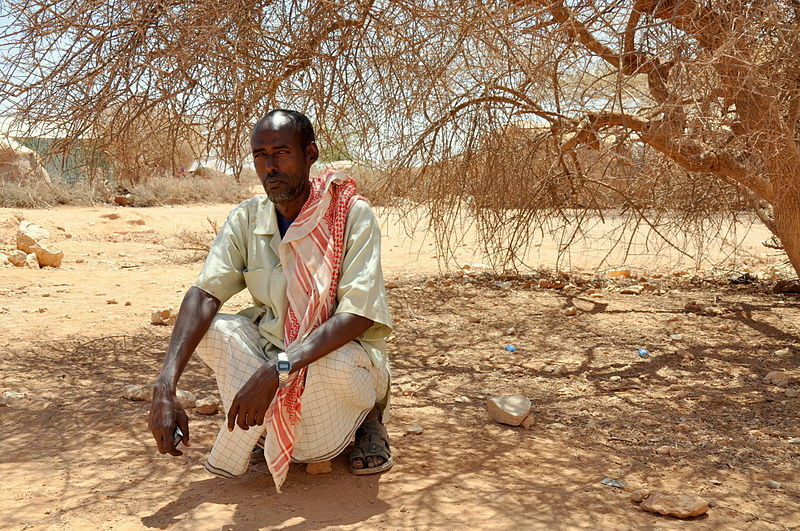 Somaliland drought. Hirsi Farah Ali, village chairman in Waridaad. Photo Credit Oxfam East Africa, 2012. Secretary of Sate John Kerry has doubled the offer of assistance to the most climate-vulnerable countries to as much as $860 million a year by 2020 for adaptation to climate impacts, but the U.S. has refused to agree to longer-term financial provisions that would aid developing countries in meeting emission reductions. According to a recent study, the U.S. is most responsible for warming. Developing countries believe the U.S. and other richer nations should financially support those who agree to limit future carbon emissions, but can not afford to choose renewable energy solutions over more readily-available fossil fuels. Without this financial aid, poorer countries are being asked to forego future development by limiting their emissions to address a problem created by richer nations. The good news is that the U.S. has agreed to support the more ambitious target of limiting warming to 1.5°C above pre-industrial levels. However, support is tied to reduced aid for developing nations and further agreements by those nations to concede their rights to liability and compensation for impacts that they will incur due to warming already underway. In the closing hours of Paris talks we have been presented with a draft deal that denies the world justice. By including a clause for no future claim of compensation and liability, the US has ensured people suffering from the disastrous impacts of climate change will never be able to seek the justice owed to them. This unfair and unjust draft deal won’t face up to the realities of climate change and will only serve to widen the chasm between rich and poor. Also, making a voluntary pledge of 1.5°C won’t be enough to prevent ruinous warming, given that the current commitments from the U.S. and other participating countries for emissions cuts would produce at least 3°C of warming by 2100. Only a clear, binding commitment to leave fossil fuels behind entirely by 2050 coupled with an ambitious mechanism to scale up current commitments can deliver the progress science demands. With the Paris talks scheduled to wind up on Saturday, optimism still prevails that the negotiations will produce a working agreement that includes: (1) meaningful commitments from participating nations; (2) pledges that can be increased over time; (3) verification mechanisms to determine whether wealthy countries are following through with their target reductions; and (4) continued dialogue regarding the responsibilities of developed countries to their developing counterparts. Meanwhile, activists continue to call for an agreement that acknowledges the rights of developing nations; provides support for those who are the most vulnerable to climate impacts; and accountability for developed nations who are most responsible for the climate crisis. Environmental leaders in the U.S. predict a growing and vocal movement in solidarity with poor countries and a global call to keep fossil fuels in the ground. Continued pressure on President Obama, Congress, and other officials. will be needed to fully decarbonize by 2050 and to provide meaningful funding to poorer nations so they can develop without fossil fuels.